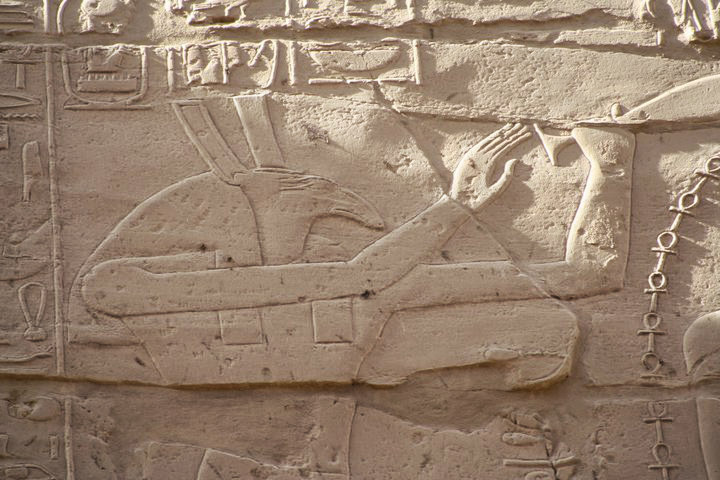 Seti I has a relief of himself being blessed by Set and Horus, which is at the large Karnak temple. 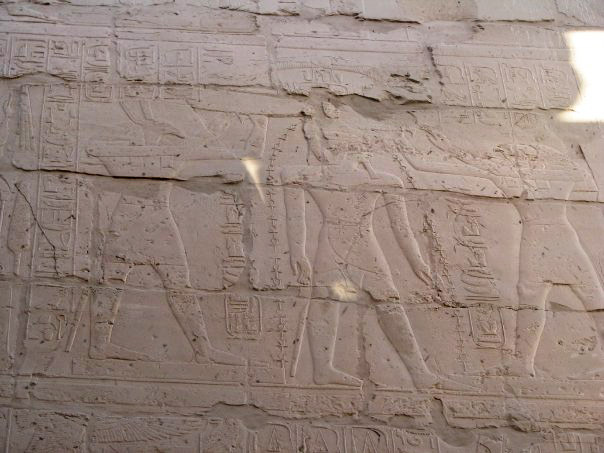 Hans Kontkanen, who visited Karnak in December 2010, has a closer view of Set and this photo above which is even closer. 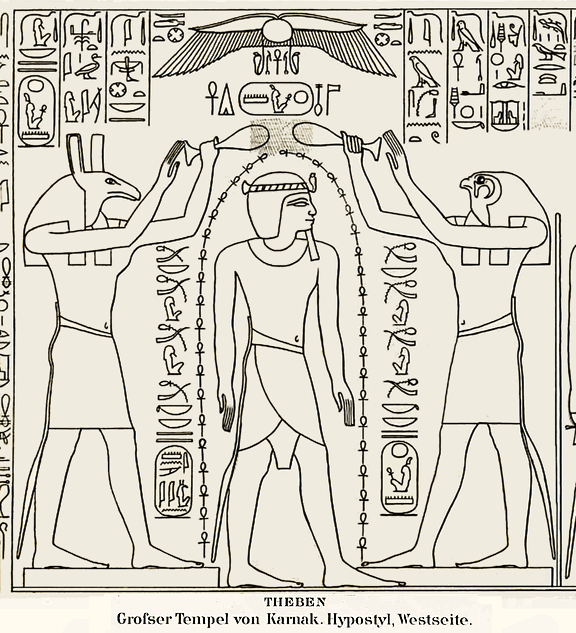 The baptismal water he refers to shows in a much later relief "Horus and Thoth purifying Ptolemy XIII at the temple of Kom Ombo". In both Unas and Ramses III, the deities have their hands at the pharoah's crown. (Cwiek, Andrej. 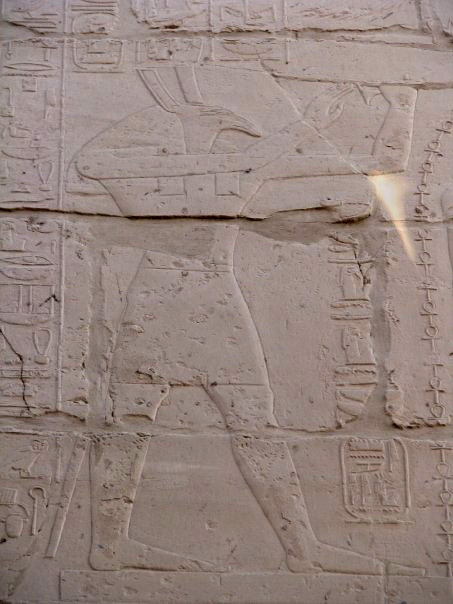 Relief Decoration in the Royal Funerary Complexes in the Old Kingdom (PhD diss., Warsaw University, 2003)). 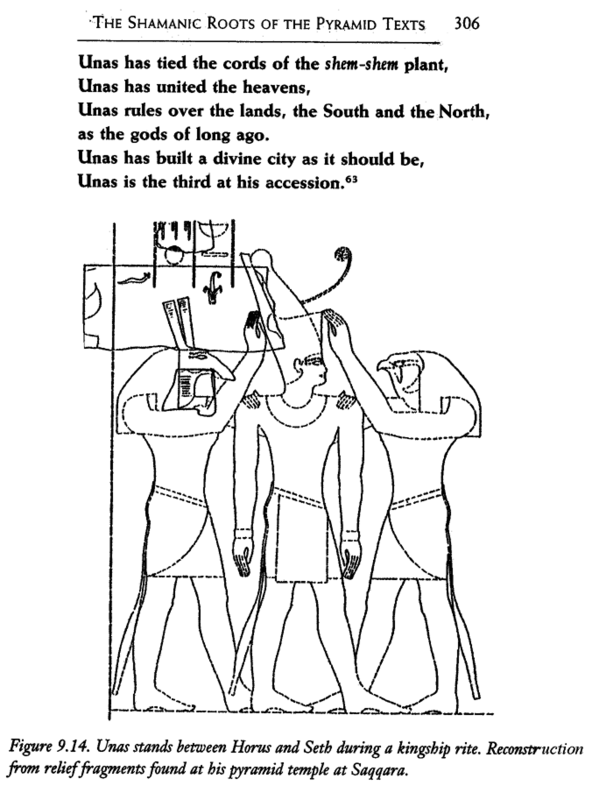 Unas rules over the lands, the South and the North. as the gods of long ago. 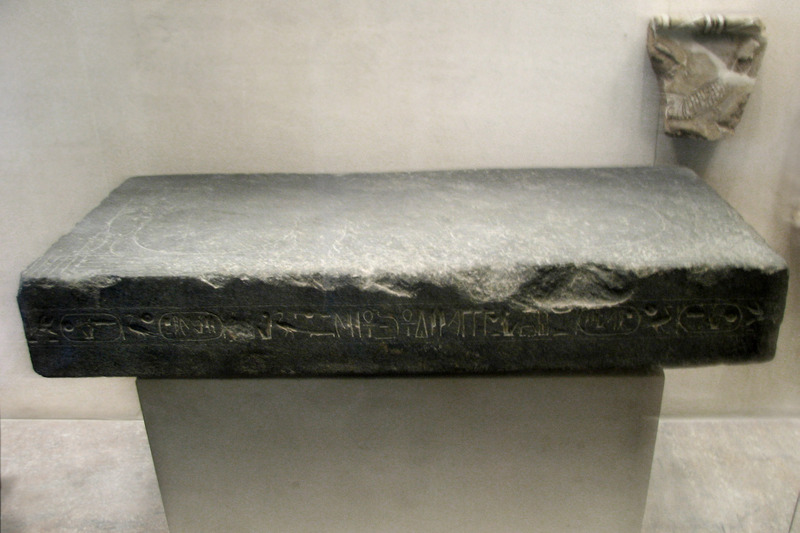 Unas is the third at his accession. 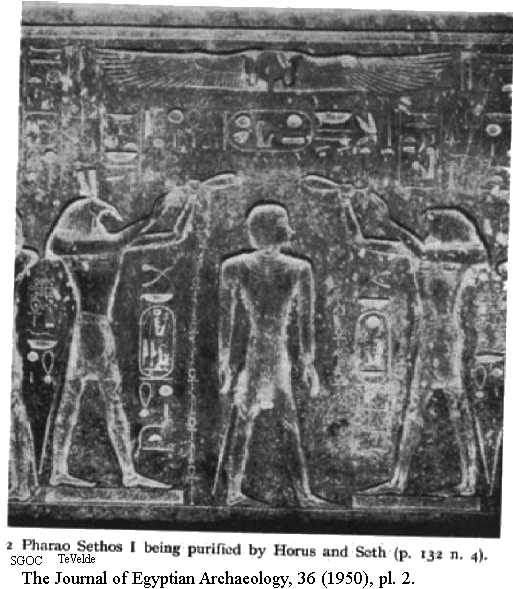 "Pharoa Sethos I being purified by Set and Horus"
The Journal of Egyptian Archaeology, 36 (1950), pl. 2. 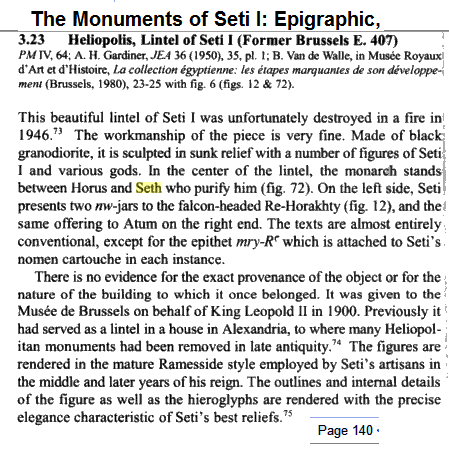 "This beautiful lintel of Seti I was unfortunately destroyed in a fire in 1946..."
Lepsius' drawing shows the details of his elaborate crown. His cartouches are there beside the portrait. 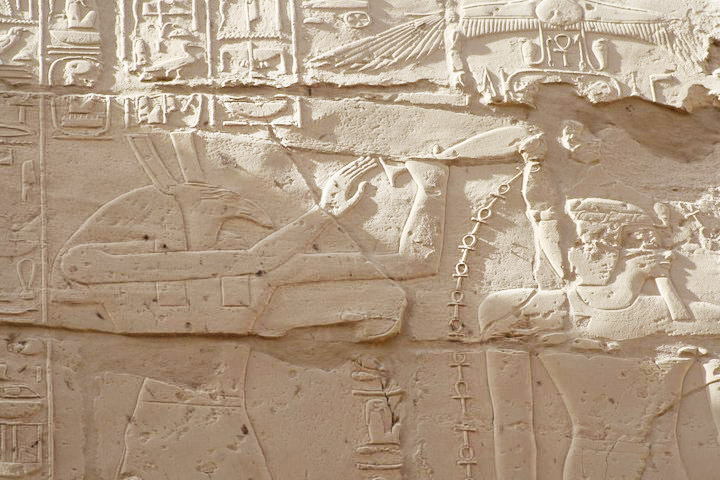 We have seen how a trick was done in their representation, particularly at the Abydos temple. New Kingdom, Ramesside, Dynasty 19�, ca. 1295�70 B.C.E. We can see the "Men-Ma'at-Re" thusly: Ra's round glyph is at the top, and the 'men' glyph (meaning 'enduring) is underneath. The goddess Ma'at faces the god Set. 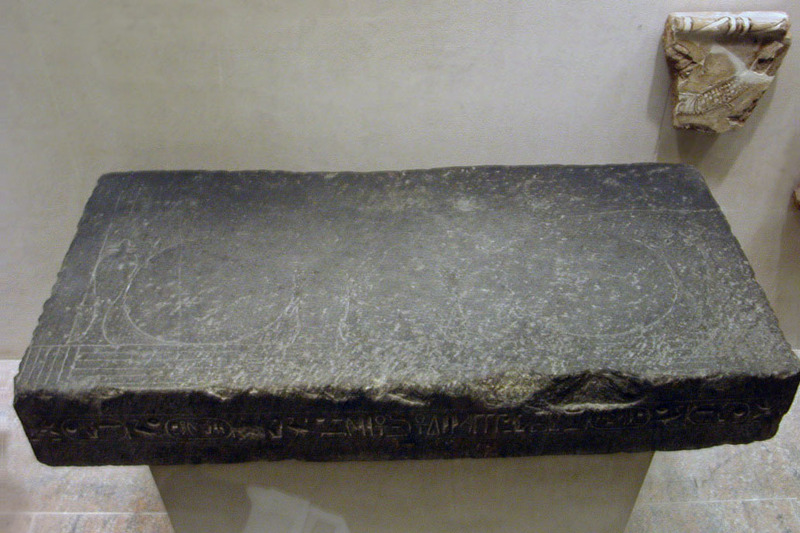 Underneath them, there is a 'mer' glyph, representing a canal which is a specially-made channel for water, and the neb 'bowl' glyph at the bottom. Neb meaning 'bowl' or 'lord' is underlining that Seti II contains within him, as he is a channel for them, the forces of Ma'at and Set. 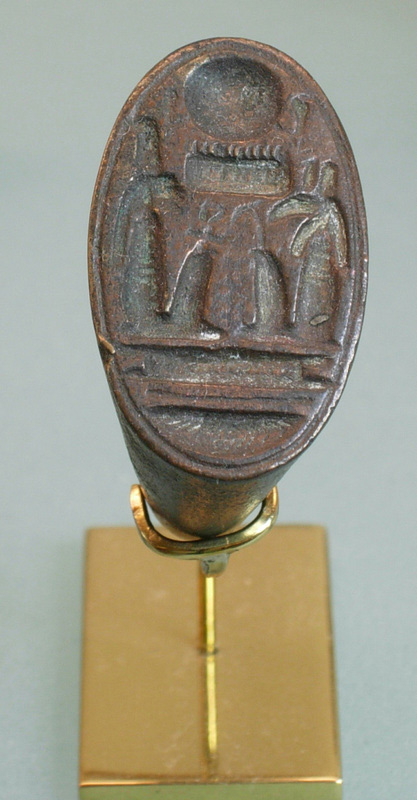 New Kingdom, Ramesside, Dynasty 19, reign of Seti I, ca. 1294�79 B.C.E. "The layout of the decoration is identical to that of the Ny-Carlsberg table dedicated to Horus, the table top being decorated with two pairs each of conical and round bread loaves and a pair of jars. On the front side, two miniature offering scenes flank the concave depression. 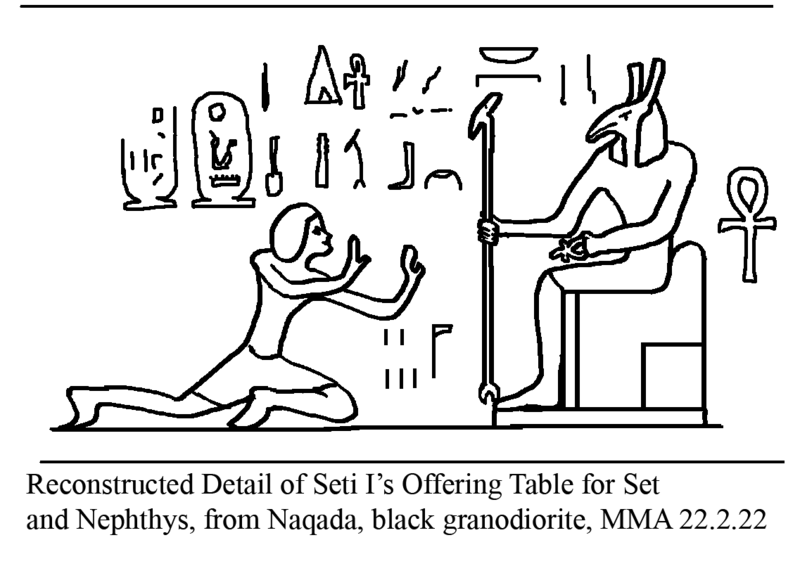 On the right, Seti kneels with his legs splayed out and his arms upraised in adoration of Seth, who sits enthroned on a plinth. The act of the king is labeled "adoring the god four times.' 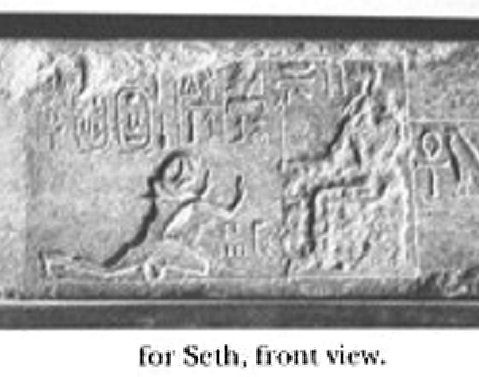 Seth's figure has been hacked out in antiquity, but its outline, as well as many internal details, can easily be made out. "On the left-hand panel, pharoah kneels in the same position before Nephthys, with his arms holding aloft a nmst-jar and a pot of incense. The scene is entitled 'giving libation.' 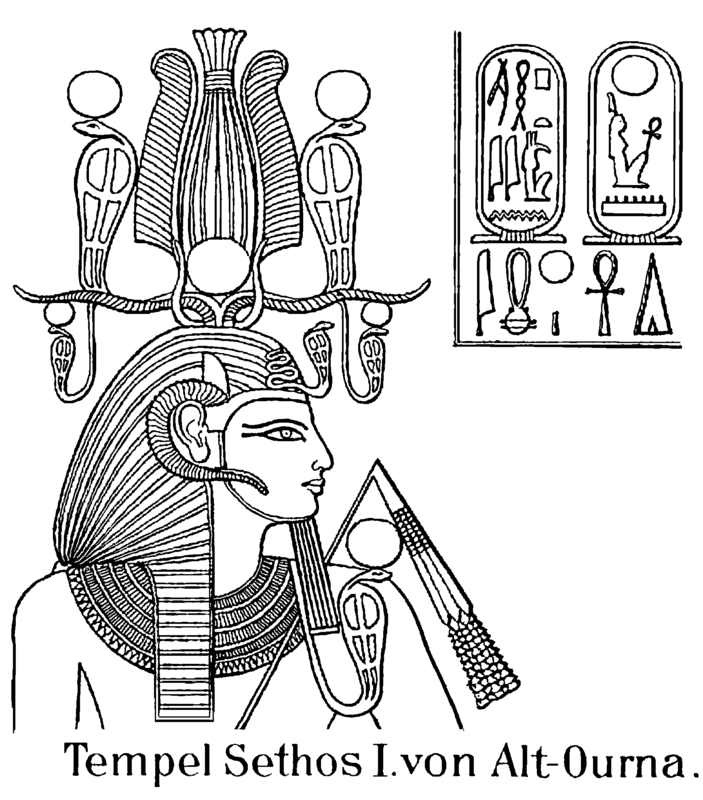 Nephthys also sits enthroned on a plinth, wearing a tripartite wig, but no other distinguishing headgear. 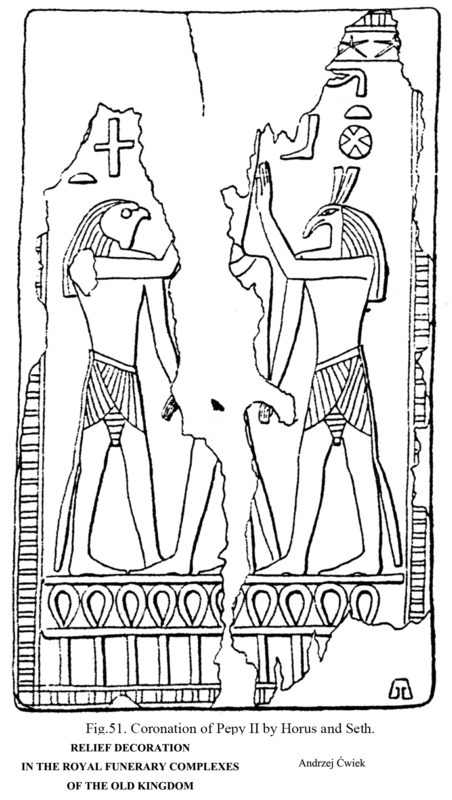 Both deities hold w3s-scepters and 'nh-signs..."
"Set's panel (right) reads: 'Long live the Horus, Strong-bull-contented-with-Truth, He of the Two-Goddess, Great-of-splendor-in-the-hearts-of-mankind, Horus of Gold, Contented-with-strength-and-beloved-of-Re', the King of Upper and Lower Egypt, Men-ma'et-Re', the Son of Re', Seti Mery-en-Ptah, beloved of Set, the son of Nut, may he live forever!'". And there's the ancient temple of Seth in Nagada (aka Naqada). It is possible that this table was once at that ancient temple. Because Mr. Roblee is taller than I am, his photo shows the top side as well!